A few weeks back I was sent a picture of a beautiful wreath with a note asking if I could make something like it. After thinking about the wreath for a few days, I came up with an idea. I could recreate something similar using fabric from a drop cloth and an embroidery hoop. This is the wreath I came up with. This is the picture that was sent to me. Jamie from Dear Lillie is constantly changing this wreath to coordinate with her seasonal decor. 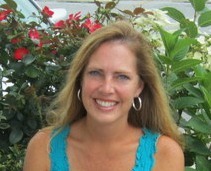 You must check out her blog here and see the many different looks this wreath has had. She has such a beautiful home and I adore her decorating style. Here's my version with a little holiday greenery. To make this wreath I started off with a 10" wood embroidery hoop and a drop cloth. I also removed the screw for now. Next, I cut two loonnnggg strips of drop cloth fabric. One strip was 5" wide and the other was 3" wide. with enough room to slide the embroidery hoop through the middle of the seams. until all of the fabric was around the hoop. and I just straigthened and adjusted the fabric around it. I decided to make a bow out of the drop cloth just to add a little something. It doesn't look exactly like the Dear Lillie wreath, but I think it turned out pretty. I also like how versatile this wreath is. or it can be decorated differently for each season. 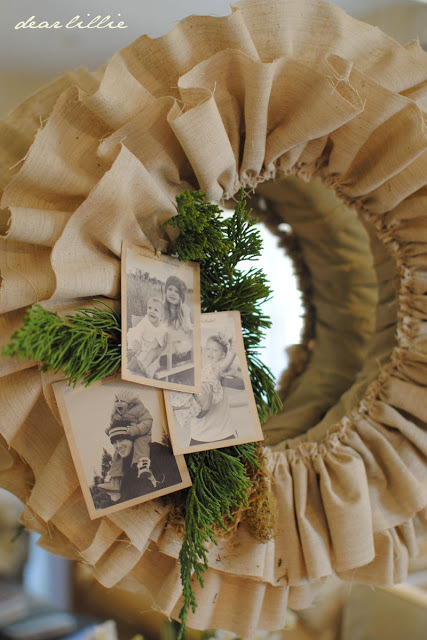 This wreath could be made with burlap, denim or just about any fabric you want to use. Each ruffle could even be a different fabric. You could also use different size hoops to make smaller or larger wreaths. This wreath is available in my Etsy shop here and I would welcome custom orders. and even some cute little pumpkins made from drop cloth fabric you can look at here. Thanks for sharing some of your time with me today and Happy Fall! Thank you. I would've made a few more already, but the tension in my machine is not working correctly and I can't seem to fix it. I'll have to take it to the repair shop before I can make some with different fabric. I'm thinking red striped ticking fabric for Christmas. This is gorgeous! I'm terrified of my sewing machine, but I don't think I have any choice but to try this :). Thanks for the tutorial!